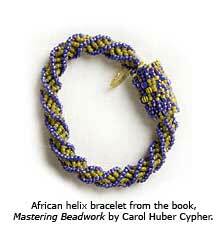 Learn African Helix Stitch in 4 Steps! It’s a cliché and dorky tradition, but my husband and I light a candle and make resolutions on New Year’s Eve. We’re each allowed only one. And those amorphous “I’m going to eat healthier” or “I will strive to be a better person” type of resolutions won’t fly. What we come up with are more like personal action items. They have to be utterly simple: things we know we can and will do without being overwhelmed. For instance, one year mine was “make one new friend in the neighborhood”. That was pretty easy to accomplish. Joe’s was “run an Ironman race.” That one seemed ridiculously overwhelming to me, but my dear obsessive mate crossed it off his list, no problem. I haven’t figured out what my one resolution will be this year. Beading Daily editor Michelle Mach asked me recently what I wanted to do in 2009 and I told her I wanted to teach more beading classes. But that’s really more of a professional goal than a personal resolution. Do 10 pull-ups . . . in a row. Count to 20 in Mandarin. 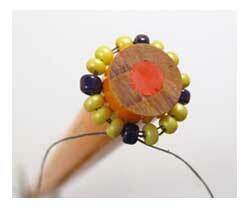 Learn 1 new beading stitch. If learning new off-loom stitches is on your resolutions list, too, I’d highly suggest checking out Mastering Beadwork by Carol Huber Cypher. Carol describes how to do 15 different off-loom stitches with numerous variations within each stitch like increases and decreases. She outlines the regulars like peyote and brick stitch, but also shows how to do lesser-used techniques like triangle weave, daisy chain, polygon ropes, scallop stitch, and bead crochet. To top it off, after each stitch how-to she presents several projects—63 in all. It’s really quite a book, and if you’re itching to learn lots about off-loom beadwork, buy Mastering Beadwork. Carol describes one stitch that I learned a long time ago from Virginia Blakelock, but I can’t remember the last time I did it! It’s African Helix—a looped-thread rope technique. Want to re-learn it with me? 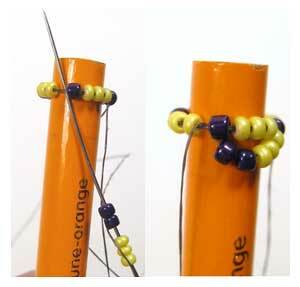 You’ll need 2 size 11° seed bead colors (A and B), a needle, beading thread, and a pencil. Place the needle on the thread and string 3A and 1B four times, leaving a 3" tail. 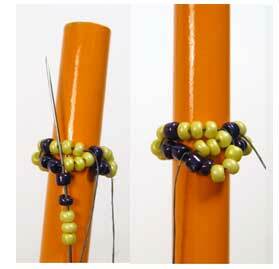 Tie a square knot to form a circle, pass through the beads again, and exit from 1B. Slip the ring over the pencil. 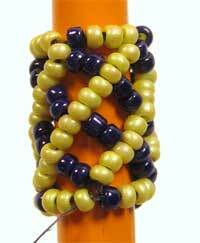 It’s okay if there is a bit of space between the beads. If it helps you keep your place, tape the tail thread to the pencil. String 3A and 2B; pass the needle under the thread between the next 1B and following 3A. Repeat around the ring. To make the first loop of the next round, string 3A and 2B; pass the needle under the thread between the 3A and 2B of the first loop of the previous round; repeat around. Repeat to the desired length. Work the last round with 3A and 1B in each stitch. Pass through all the beads of the last round again to secure. Oh, geez. Did I just cross “Learn 1 beading stitch” off my resolution list? Better move on to another resolution. Let’s see . . . yi, er, san, si, wu, liu, qi, ba, jiu, shi . . .
Do you have beady resolutions for 2009? Please share them on the website—we’d all love to see what you’re up to!